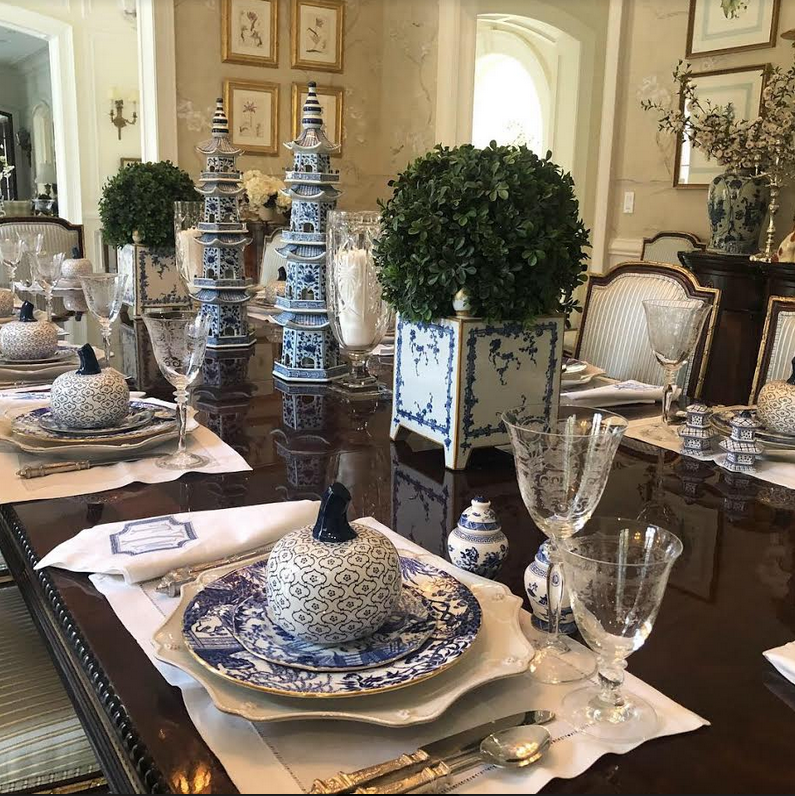 Setting a blue and white fall table! Please email us with your contact and shipping info so your salt and peppers can be on their way! So fall is here and I have to admit I am loving every minute of it. I love fall though it doesn’t quite feel the same without my fall loving sidekick by my side, my sweet Teddy. I used him in so many of my pictures that they feel empty without his beautiful face in them. 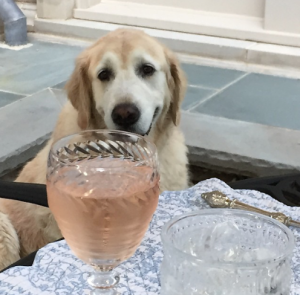 I feel lucky to have had him in my life for more than 13 wonderful years and will hold onto those memories for a very long time. 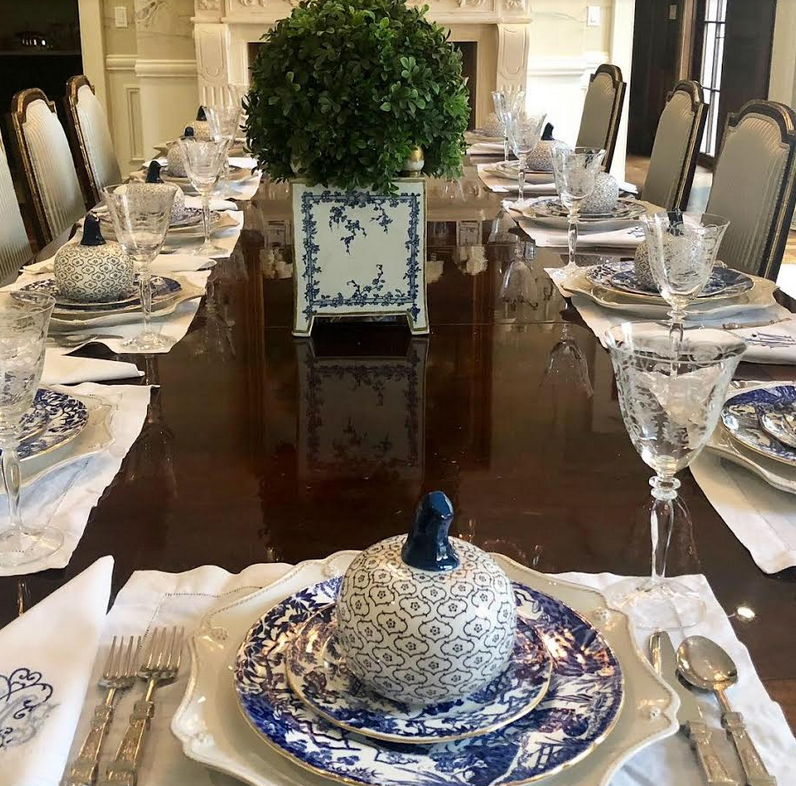 Anyway, hosting a dinner next week and decided to take advantage of spare time and set my table early. I wanted it to feel fall-ish but did not want to do the brown and orange predictable fall color theme. 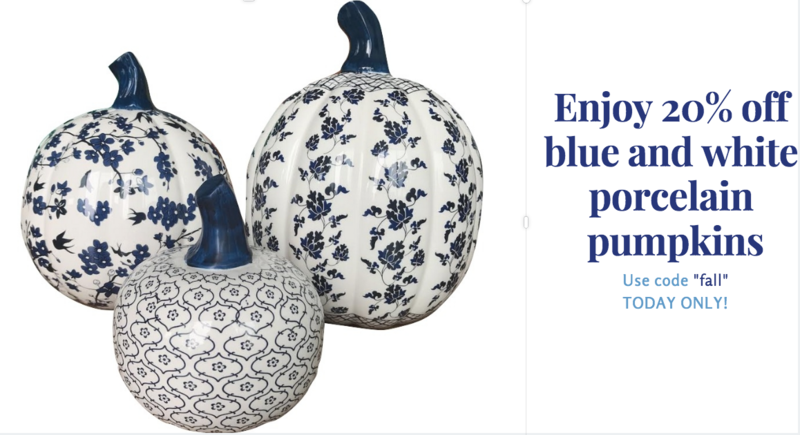 I wanted blue and white and wanted to make my gorgeous pumpkins front and center. 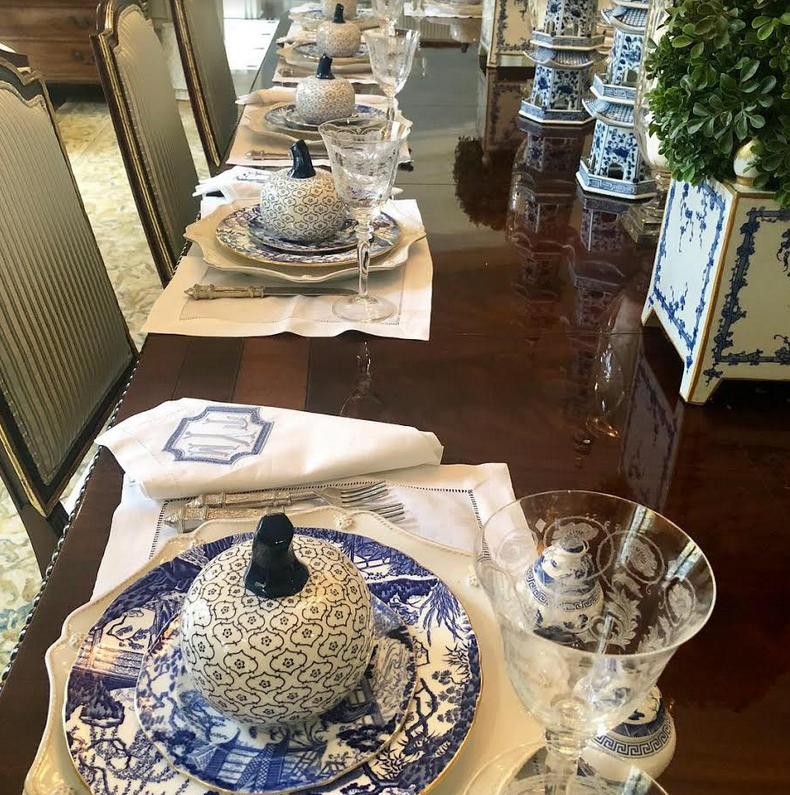 So I got 12 of my newly arrived porcelain pumpkins in small and used them as a centerpiece for each place setting. 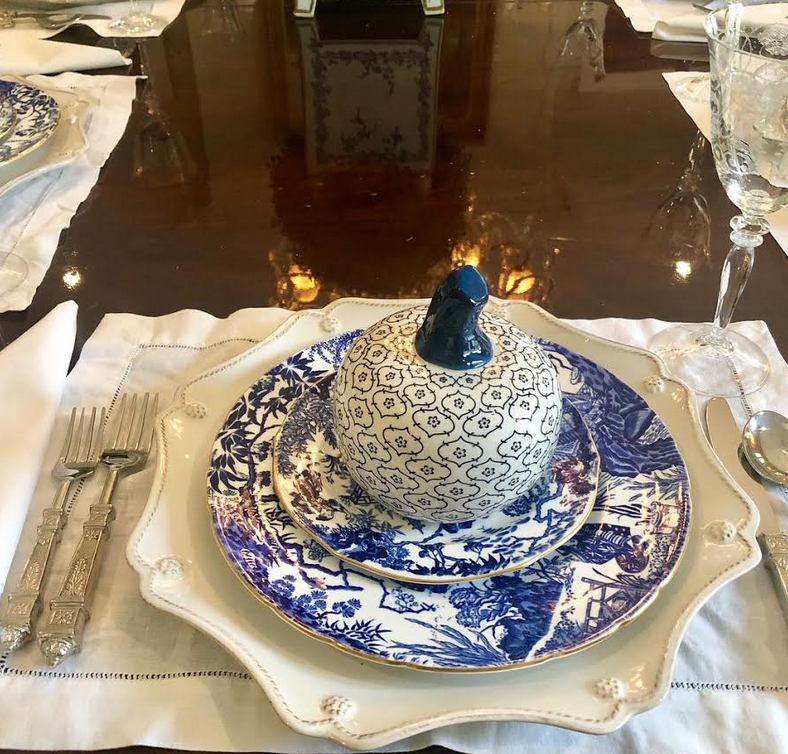 I then added my beautiful china from Royal Crown Derby and continued to layer. I love the effect, and to me, this is proof that blue and white is right for all seasons, fall included! 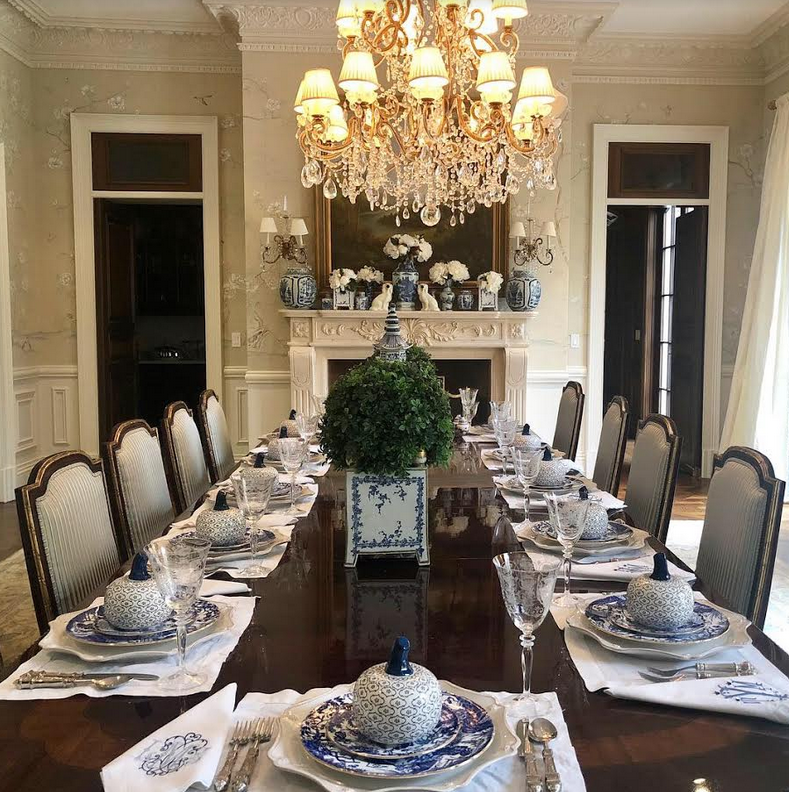 Yes, blue and white works beautifully for fall! I just love the gorgeous blues and the decorations it’s just awesome. The pumpkins are what really made the difference…they were your ‘nod to fall’! Tina, you just keep cranking out amazing new stuff! What a talent you are! Who would have ever thought of such a great idea? Happy fall! Everything is sooo BEAUTIFUL! I would add a narrow garland of magnolia leaves and faux white blossoms down the length of the table to add a more fall look. Hope someday you can find another wonderful dog (rescue? )…….smaller ones live longer and are more portable…….in loving memory of precious Teddy. 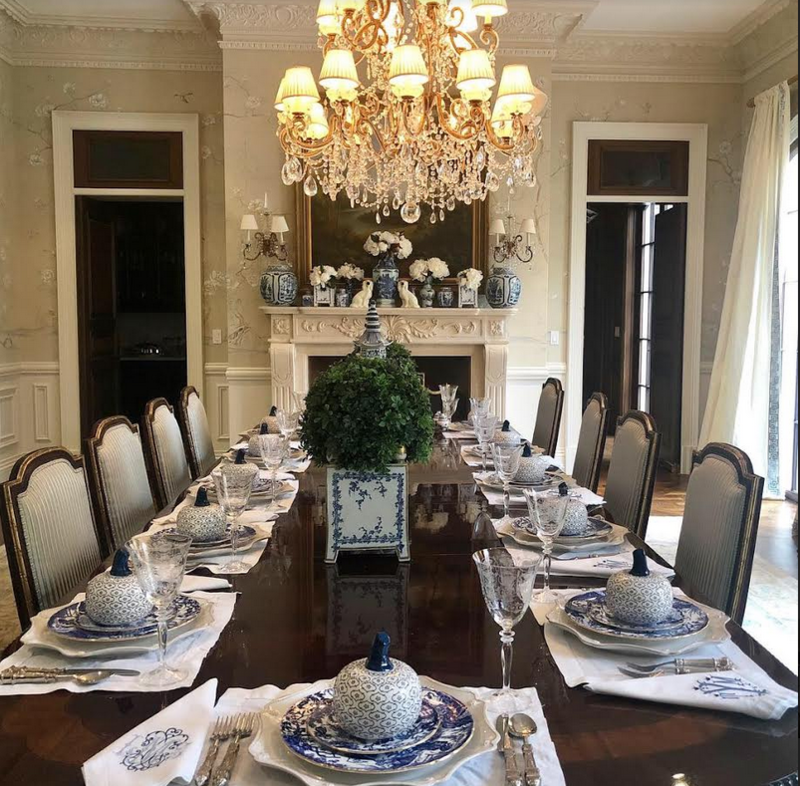 What a luxury to set the table in advance! As usual, absolutely lovely. The pumpkins, of course, set the fall scheme. Always enjoy your decorating. This is so beautiful! 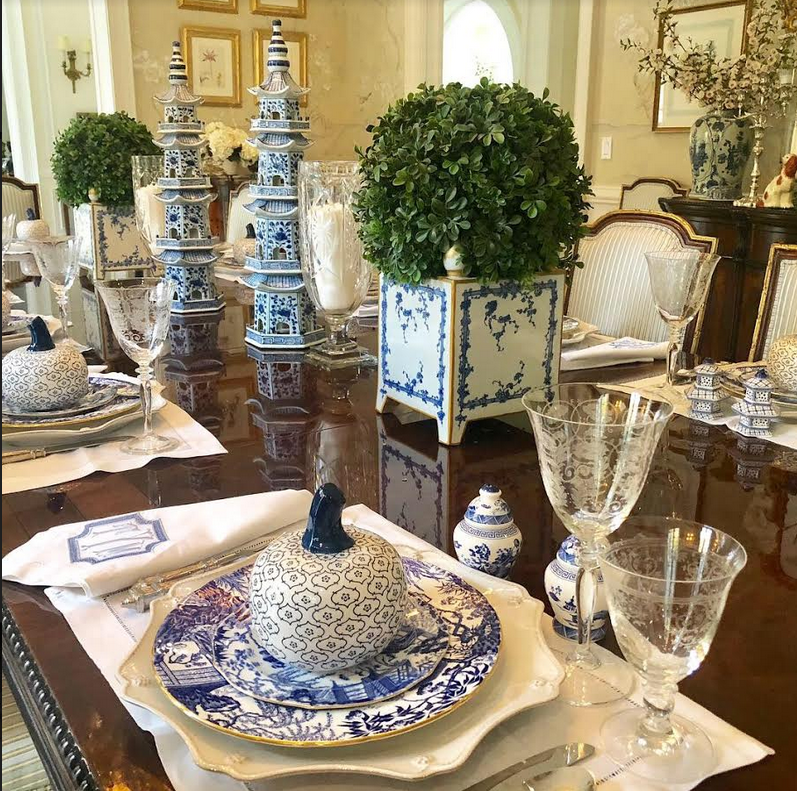 I love a blue and white table for fall, it is so sophisticated. Gorgeous Tina! Gorgeous! 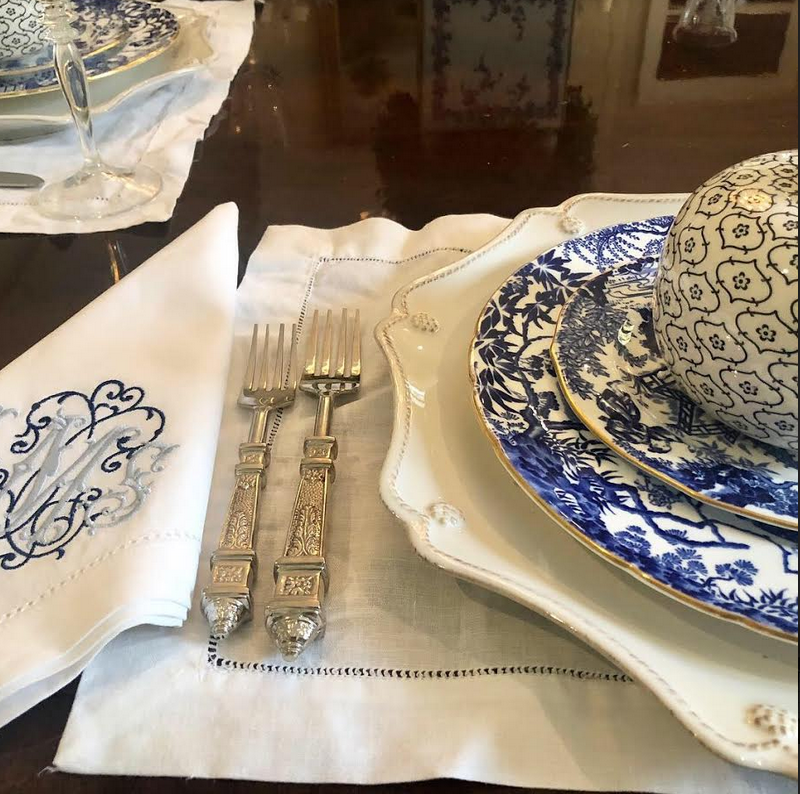 Beautiful detail….I am a detail oriented person in this table is absolutely gorgeous! NICE FOR SPRING,CLEAN COLORFUL BUT FALL SHOULD BE ORANGE, BROWN YELLOW,RED, RICH COLORS…..COLORFUL! SORRY, THAT IS WHAT FALL IS TOO ME. BLUE & WHITE VERY NICE BUT THINK THE FALL SHOULD BE RICH IN COLOR BEFORE DREARY WINTER! YOU ASKED ,I TOLD! SO BEAUTIFUL! As someone who does not like orange or brown, this far surpasses a typical fall tables cape in how sophisticated it is. The touch of the pumpkin adds just enough of a fall motif without screaming “kitschy fall decor”. As usual, you nailed it Tina. I got notification that my pumpkins are on the way and am so excited to display them (possibly year round)! Oh my goodness! I have been out of town, and just now catching up! I just saw my name as the winner! Thank you so much! I will get an email out to you right now! !